Shop Front Re-Spraying Case Study. The Tiger chain started its life in Copenhagen and since 1995 has opened over 200 outlets in Europe including 20 in the UK. 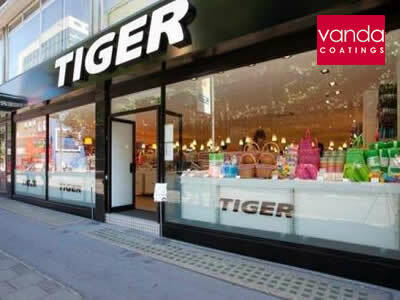 Tiger Retail Ltd is half owned by a British company and as part of its mission to expand in the UK they asked Vanda Coatings to re-spray their shop front on the Tottenham Court Road in London. Following the re-spray, Tiger was chosen by John Ryan as ‘Store of the Week’ in the magazine Retail Week, partly because it is a good example of how a good shop front should look. Retail Week also highlighted the opening of this particular outlet because it is likely Tiger will become a destination store which would help increase footfall at the southern end of the road. For the re-spray of Tiger, our professional Vanda team started work at midday and all trades were on site. One of the reasons our services are specifically asked for time and time again is because we are used to liaising effectively with all trades. Many fit-out projects involve a range of people working on various aspects of a shop interior and exterior, or a shop may be in full working order during a re-spray. We know that working alongside others in a safe and considerate way is important. Preparation is often the most time consuming aspect of a re-coating job and this was the case for Tiger in Tottenham Court Road. The blue shop front was originally in a poor state, so our experienced team spent over 5 hours making sure that every hole and dent was filled properly. Our team leader, Grant maintained he wasn’t exaggerating when said he used half a ton of filler! Once the marks in the substrate had been filled in and the filler dried out, the surface was sanded until smooth because Grant and Steve pride themselves on perfect finishes. The team then started spraying the frame (which consisted of 3 large windows and a double entrance) at about 8pm after other trades had left. The re-spraying itself took just over 2 hours. The next stage was de-masking and clearing up. Grant and Steve were determined to leave the site in a better state then they found and good housekeeping (as Grant puts it) is a crucial part of any work that they do. The entire shop front re-spraying project was finished by 9pm and a good job was done, so hopefully this great looking shop front will help add to Tiger’s rocketing profits which in turn will serve to regenerate the rest of the high street.